yep, those banana chocolate chip mini muffins are one of my most requested baked goods. people love them. and when i say people, i mean my hubby. because he actually gets pretty delighted when he sees those bananas on the kitchen counter starting to turn all brown and ugly-looking. because it means that those mini muffins can’t be too far off! i’ve found that organic bananas seem to take a bit longer to get brown and smooshy, which is really where you need them for this recipe. so i often will place them in a brown paper bag, just to speed up the process a bit. it really works – give it a try. another way to get the bananas just the way you need them? check in with your local grocer! it’s likely they have bananas that have ‘passed their prime’ and are too brown to be out on display. they will happily give them to you at a discounted price. and you’ll have bananas in exactly the perfect state for this recipe! 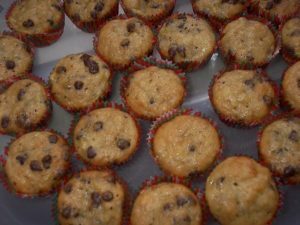 check out this tried and true recipe for banana chocolate chip mini muffins. it’s an oldie, but definitely a goodie!